Looking back at January 2013, were my local climatic conditions much different to that of 2012? Firstly, in the United Kingdom, 2012 began as “the year of the drought” * with recorded precipitation totalling 32.8mm in my neck of the woods. By comparison, January this time around looked like this. In total, we received 61.6mm, which is still below the revised 1981 to 2010 mean by approximately 25% or so. What about the Air Temperatures? January 2012 was mild in comparison with some 11 double-digit Fahrenheit Maximums being achieved back then and unsurprisingly a mean of 0.8c above the long-term average, mentioned previously. 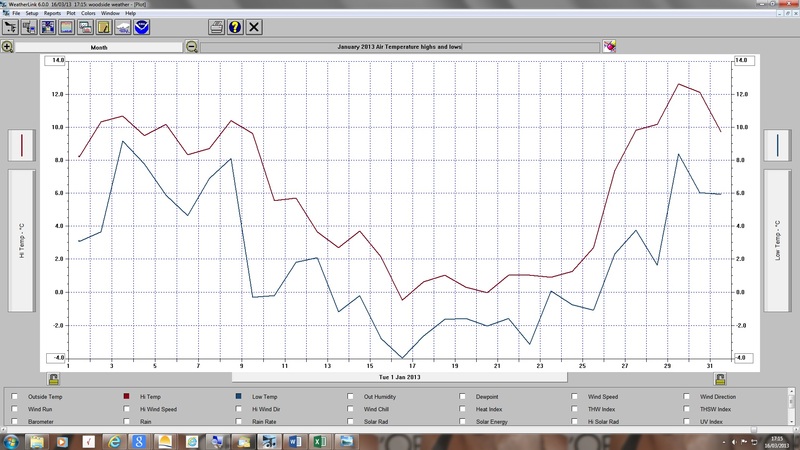 This time around, January 2013 saw the following daily Air temperature trend. Due to almost two-thirds of January 2013 being in the cold to very cold category, it is unsurprising that the mean return of 4.0c was below the long-term average by 0.6c. 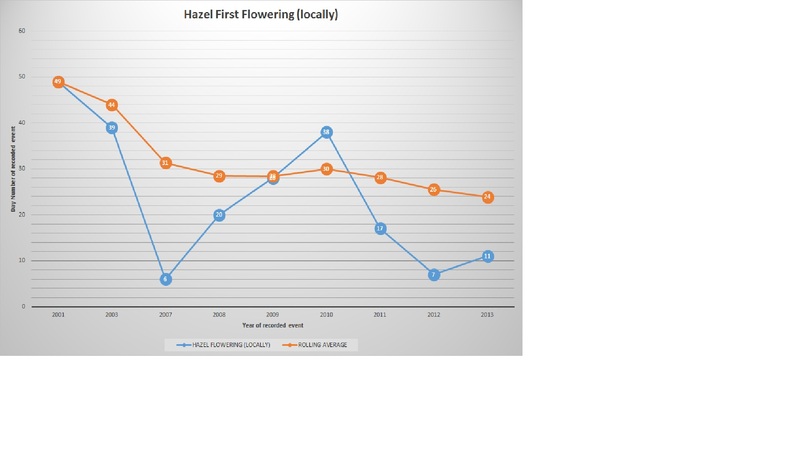 As a result of the above, can you guess which phenological indicators were to show themselves amidst the cold of January? The first Primroses (Primula vulgaris) were witnessed in bloom on 5th January. 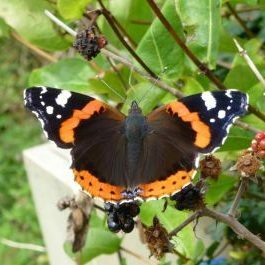 However, before we jump for joy at seeing them so early in the year, one should perhaps, read an excerpt from Richard Mabey‘s wonderful Flora Britannica. In there, Richard states that they are not the most reliable of indicators when it comes to tracking climate change. Oh well! They are however, beautiful to see and always brighten up a dull day. 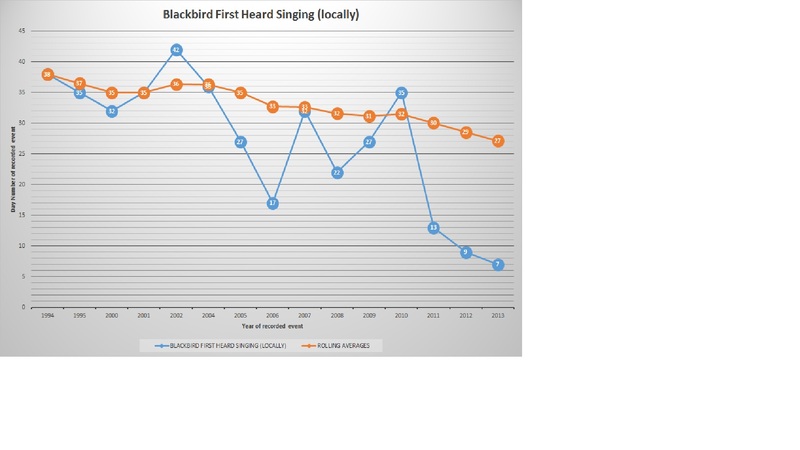 An early songster is always nice to hear and one of the first to embrace the New Year was the Blackbird (Turdus Merula). I first heard the 2013 song of this particular species on 7th January, whereas last year it was 9th January. A personal sound recording of a Blackbird can be heard below. This link will take you to another website, which upon opening, you should click the orange icon on the Left Hand side of your screen to allow playback of the sound recording. 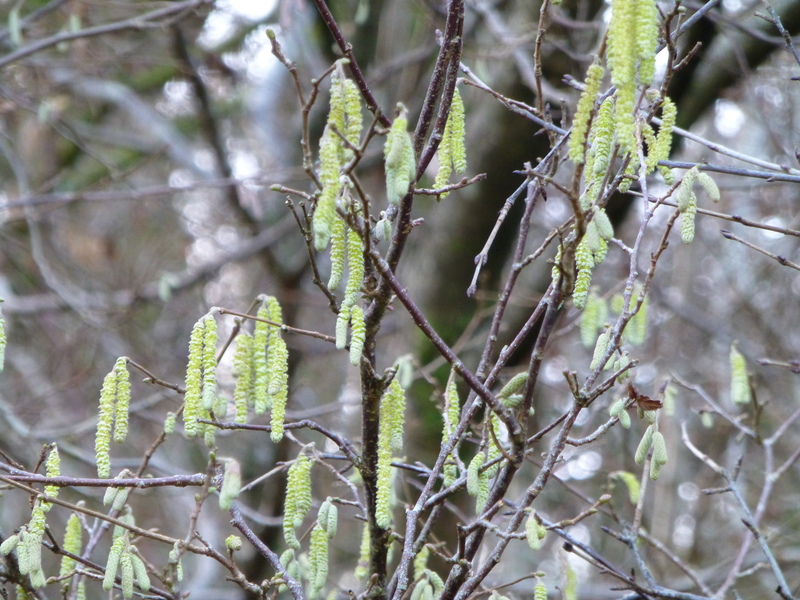 The next phenology indicator of interest came courtesy of First Hazel Flowering (Corylus avellana) on 11th January. 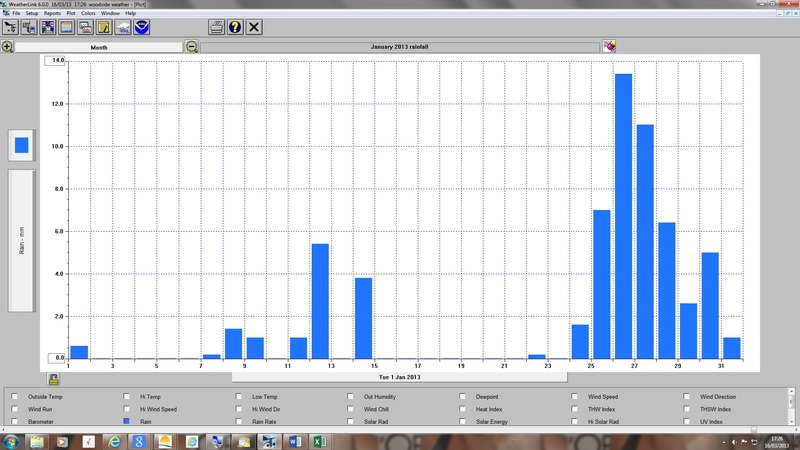 This compares favourably with the 7th January sighting from the previous year. A record shot of which, I have attached below. The final phenologically related event of any consequence came about on the 21st January. This revealed itself in the form of a Chaffinch (Fringilla coelebs) first heard singing. The corresponding date last year was the 13th January. 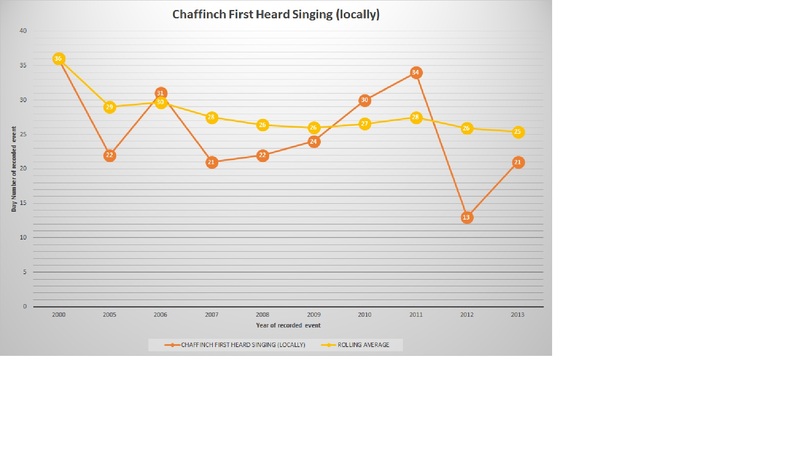 A personal sound recording of a Chaffinch singing is available via the link shown below. 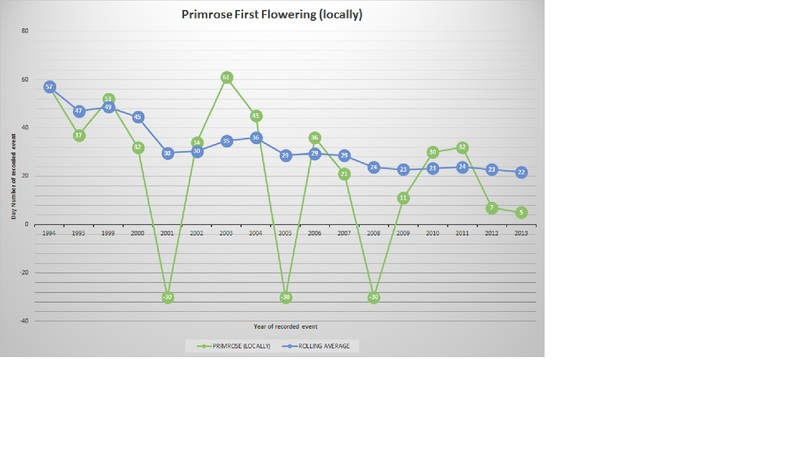 A final way to view the ongoing trend in my datasets is to observe them in graphical format. Good news! Represented below are the aforementioned sightings in such a manner. Please note each event recorded annually is represented as a day number and not in date format. The events have been logged, only during years, in which I managed to achieve a meaningful result. Please make what you will of the data. Given the cold conditions of January and the fact that I have often been preoccupied in my personal life, things have been rather slow to unfold. February was to prove a different story. * The year of ongoing drought quickly became the year it never stopped raining, officially 2nd wettest in Met Office recorded history. Wow, thanks for this, I must say I feel like an Old School naturalist at times, given the observational work required, all of which is undertaken voluntarily. Learning from the Natural World keeps me sane though, I suspect the same can be said of you.